Nerine sarniensis bloom as a nice full cluster of trumpet-shaped flowers with protruding stamens on a leafless stem. The petals are covered with an iridescent sheen that makes the flowers look as if they have been sprinkled with gold or silver dust. The sarniensis species flower for several weeks before the start of overall plant growth and strap like foliage development. Watering is the opposite from the bowdenii species: keep them fairly dry while the plants are growing during the Summer. Water them well during Winter dormancy when grown outside in warmer climates or when grown in pots in colder climates. They are exquisite for bouquets: their keeping quality is excellent. In borders, containers and as cutflowers. South Africa. The common name 'Guernsey Lily' was initially given to the sarniensis species after some bulbs, having been shipped from South Africa, washed ashore there during a storm after which they rooted, bloomed and gained attention of horticulturists. 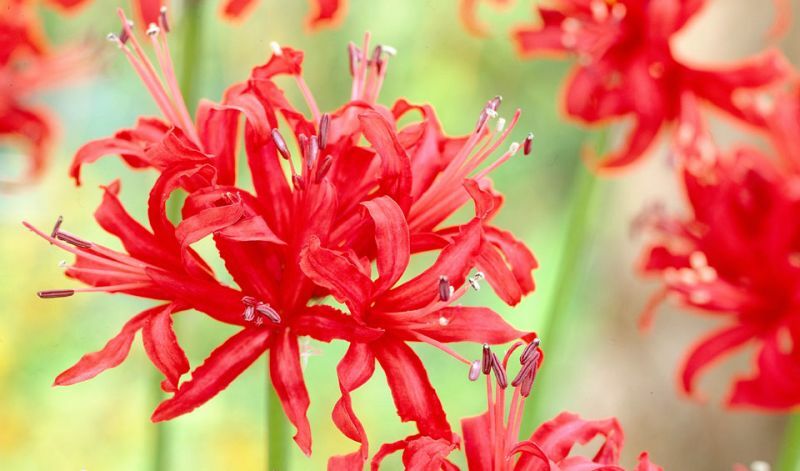 Thanks to this sea voyage Nerine itself got its name being named after the 50 beautiful daughters of the sea-god Nereus.